Small Business Marketing Plan for 2017: The Time is Now | Zen Marketing Inc.
Have you created your new marketing plan for 2017? If you’re like many busy entrepreneurs, the answer might be, “Not yet,” or “We’re using the same one as last year,” or worse, “I don’t have one.” Yikes! If you’ve been flying by the seat of your proverbial pants, you may be suffering from what’s known as Shiny Object Syndrome. This insidious disease tends to develop quickly in new entrepreneurs and can become chronic if steps aren’t taken to prevent and treat the condition. The new year is right around the corner, so it’s high time you take a step back and look at the big picture. Look not just at your company, but at yourself. Do YOU suffer from SOS? If you’ve been chasing leads at random, pouring all your energy into “the next big thing,” and jumping from one marketing tactic to the next without giving much thought to your overall strategy, then you’ve got the bug. But before you throw your hands up in despair, take a deep breath and relax. We’ve got the cure for ails you. You can’t create a marketing plan without first knowing who you’re marketing to, so the first step is to identify who your customers are. This is done by a process known as a persona development, and, despite that big companies often spend tens of thousands of dollars on this step, the fact is, you don’t have to. Start by collecting whatever data you can get your hands on, which you can then use to build your customer profiles or personas. Talk to your sales team, examine your online sales history, and review your email marketing lists. You might even use tools like forms and surveys to gather additional info about your customers—who they are, how much they spend, why they buy your products, etc. Then use the information you’ve gathered to create profiles—much like a police sketch artist renders a composite of a suspect, but in written form. As you continue to broaden and deepen your understanding of your customers, you’ll be able to refine your personas as well as create more of them. To start, though, one or two detailed personas will do just fine. Now that you know who your target customers are, it’s time to get real about numbers. How did you do over the last year? Was the money spent on marketing well spent? If not, why? What can you do differently? How much do you want to spend this year? How much do you want to make? Answer these questions carefully, and thoughtfully, then create a marketing budget for next year. For most small businesses, it makes the most sense to break your budget down by quarter. This makes for manageable chunks of numbers from which you can easily glean data to determine if you’re on target. Before you consider how you’ll spend your marketing dollars, consider that the most expensive forms of marketing aren’t always the best. Just because you have the funds for that fancy TV commercial, doesn’t mean you shouldn’t drop $25,000 into a single bucket. Again, consider your customers. Go back to those personas. How do your customers want to receive their information? How much of that information do they need to make their buying decisions? Use that info to zero in on what you customers need to bite the bullet and buy your products or services, and then meet their needs by educating them. This is known as content marketing, and it’s a form of inbound marketing that seeks to educate consumers in order to help them make informed buying decisions. This kind of marketing addresses your potential customers’ pain points, providing them with solutions to common problems. Along the way, it builds interest in your set of products or services and ultimately establishes you as a trusted expert. Blog posts, white papers, e-books, animated videos, infographics…these are all forms of content marketing that help your customer understand your value and, ultimately, buy your products. If you’re a solopreneur or a small shop, launching an aggressive multi-pronged campaign may not be the best idea (especially if you’re marketing efforts last year were decidedly lackluster or even nonexistent). The message? Don’t bite off more than you can chew. You’re better off starting relatively small, with tasks that you are confident you and your team can handle (or affordably outsource). Put your money into those activities that you believe will bear the most fruit, rather than spreading your dollars around into a dozen or more marketing buckets. If you’ve determined it’s time to finally launch that blog, be reasonable about your goals for publishing posts. Start with two per month—you can always readjust your targets in subsequent quarters. Create a calendar of posts in advance so you aren’t scrambling to figure out what you’ll write about. Better yet, hire a professional who can do the work for you, leaving you to the tasks of running your business. Build a detailed marketing plan for 2017 that includes your overall marketing strategy and quarterly goals. Make sure your goals are well defined and easily measurable so you can stay abreast of your progress and hold yourself and your team accountable, and include the specific tactics that you’ll employ to support your overall strategy and hit your targets. Assign each task and include due dates and relevant costs so you can track your spending. Be clear and specific, but don’t get caught up in the weeds. 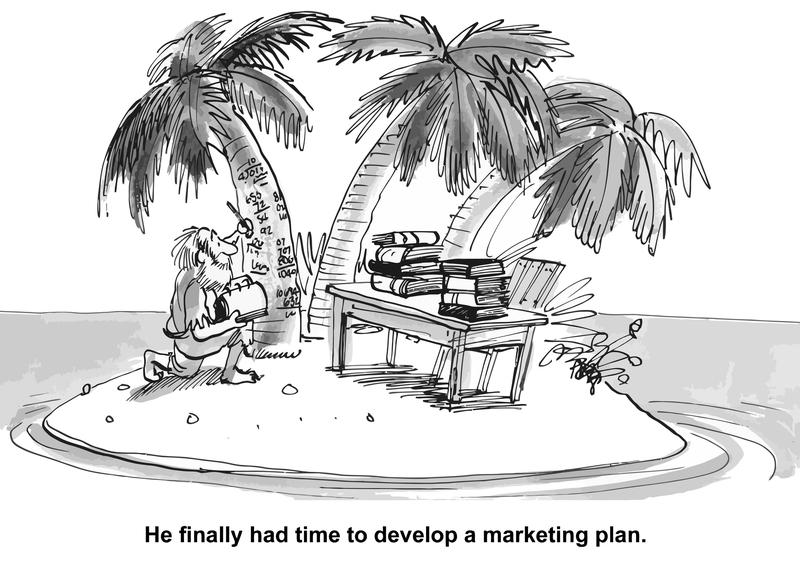 You don’t want to get so stuck on creating the perfect plan that you never get around to actually implementing it. You can—and should—revise it as the year progresses. So, do it well, but get it done, and move on. Rather than throwing yourself blindly at that shiny object—whether it be Facebook ads, commercials, or 5,000 promotional pens—consider what your customers need to bring them deeper into the sales funnel—and then deliver it. That’s not to say that a T-shirt with your logo on it is a bad idea—it’s just that if you’re selling a line of, say, constipation relief products, your customers may not be all that interested in parading around in your logo’d apparel. Consider your customer, consider your product, consider your numbers, and relentlessly question the value of what you’re putting out there. If you build it right, they will come.